Tea Leaves: Are You Experienced? I play games; a lot of games. Many of the games I play are computer games. Some of those are of the broad category called "Role-Playing Games," or RPGs. There are many definitions of this, but a simplified one is: if it sounds sort of like Dungeons and Dragons, it's a role playing game. I've been thinking about the mechanics of these games, and I am judging them and finding them wanting. In particular, the concept of "levelling up" in nearly all of these games is tied, in a nearly inextricable way, to combat. Levelling up as a concept is dubious at best, but for good or ill it is central to the RPG experience. All around the world, at this very moment, thousands of RPG players are striving to get a few more hitpoints, or to find a Blade of Lion-o with an extra +1 to hit, +1 to damage, or to find the Codpiece of Lordly Might that might let them defeat the dragon / orc / big-eyed japanese demon girl named "Sunflower." Why? So they can level up more, of course. So we're not going to get rid of levelling up. It's here to stay. People like putting emotional investment in to their characters, which means they have to feel like they're "making progress," (cf ProgressQuest), so let's buy in to the concept. Characters must seek violent solutions to problems. Characters that avoid violence will not level up as fast, and hence are more likely to be lost. The typical RPG (examples: most computer D&D games, all Japanese "Final Fantasy" style CRPGs, Wizardry) assigns an experience point value to an enemy (typically referred to as a "monster," thus adopting the implicit position that slaughtering them is OK). Kill the monsters, collect the experience points (and any loot the monsters were carrying), and eventually level up. Some games adapt the difficulty of the battles to the current level of the characters (now that's wish-fulfillment in action). Others have areas with a pre-set difficulty that require a key that the character must be a certain level to obtain. In some games, if your characters are ready to advance (from a narrative standpoint) but lag in abilities, the rational response is to wander around the world aimlessly, looking for things to kill. Some games are designed around this very principle -- consider the humble "roguelike" games like Nethack or Angband. Sometimes my best friend sees me playing Angband and asks me what I'm doing. "Knitting," I say, and this is pretty accurate -- it's repetitive, mindless, and somehow comforting. There are a lot of CRPGs that are just variations on knitting. And I think that there's a place in all of our hearts (and certainly in the marketplace) for that. I believe that there is room (and indeed desire among players) for higher aspirations as well. There are some games that tinker with the basic formula to try to provide incentives for non-combat development. Bethesda's The Elder Scrolls: Morrowind has a skill-based levelling system where a character chooses his or her primary skills, and when they have advanced (through practice) 10 of them, they gain a level. Killing monsters provides no intrinsic experience bonus, although it might allow you to practice your sword skills. It's at least theoretically possible in Morrowind to create a character whose primary skills are all non-combat -- a sort of fast talking sneaky acrobat who knows a little magic -- so let's applaud Bethesda for that. I'm uncertain whether playing the game while avoiding most combat is feasible, but at least the engine allows for it. The problem with the purely skill-based approach, of course, is that you only advance in skills you practice. I'm not pushing for a completely nonviolent game here, although it may sound like I am. Sometimes, in an adventure, you're going to have to fight. 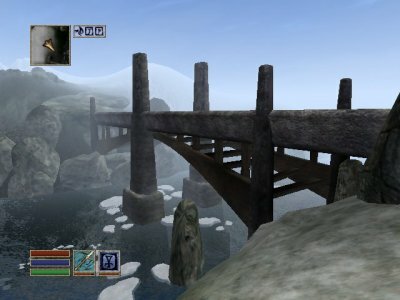 If you take the non-combat path through Morrowind, when you eventually DO get forced into a fight, you're going to be as helpless as a newborn kitten hopped up on ketamine. So pure skill-based with practicing doesn't get us there. I'm also thinking of the classic game Ultima IV: Quest of the Avatar. This had the standard kill-monsters-to-get-XP structure, but most of the interesting parts of the game were actually unlocked by ethical development, as your character strove to become the avatar of virtue. In the game world, the eight virtues were Compassion, Sacrifice, Spirituality, Valor, Honor, Honesty, Justice, and Humility. When I played it, I pretty much ignored the combat and followed the quests to develop my virtues. Again, sure, eventually you would get forced into combat, but they were a distraction from the quest, not the goal. This, it seems to me now, was good game design. I still think about Ultima IV from time to time, and think about replaying it, specifically because of the intellectual and ethical content of the game. I never think of replaying, say, Phantasie. The one modern example that I know of to follow this path is Rob Bartel's The Witch's Wake, an adventure designed for Bioware's Neverwinter Nights Dungeons and Dragons (D20) game. In Witch's Wake, the character's goal is to discover who they are and to unravel the plot. Experience is meted out specifically for reaching various narrative goals. Combat yields no experience whatsoever; it is a complete distraction. However, since advancement in D20 is not based on exercising skills, the player is free to develop their character to be effective in combat, so that they may survive difficult battles that they are forced in to. This is a sensible path, and would provide flexibility to all comers. Those who prefer the straightforward hack-and-slash solution should still be able to charge in and fight; those who want to avoid combat should be able to sneak. Diplomatic solutions should be possible in some cases. Rewards should be given to the player characters for accomplishing goals, not for knitting. Witch's Wake was a success with both critics and players. Whether this will inspire other game designers to follow in Bartel's path remains to be seen. There is surely a lot of inertia and the market can be cruel to products that aren't what the customer expects. Today, most customers expect combat and loot, because that's what we as game designers have given them. I think we can give them more. I hadn't realized Witch's Wake had the structure; I'll have to go grab it. Planescape: Torment was like this as well. You did get XP from combat, but you got substantially more XP from unearthing memories that had been hidden, so the combat XP was pretty much meaningless. It's amusing to try to figure out whether Puzzle Pirates is an example for or against each of the arguments being debated. Wow, that last URL is brilliant, even if I disagree with him about the importance of narrative to games. this article has perfectly displayed my feelings on the RPG. I wonder, does anybody know a skill based system for Dungeons and Dragons or is this just a pointless rant? I liked Morrowind's skill development style the best. It's perfect in the sense that a character can only get good at what he actually does. The obvious flaw, as you mentioned, is when the need for combat arises. But isn't that more of a fault in the world design? Why do you -have- to fight to save the day? If your character was purely about charisma and people-skills, why can't he use those skills to save the day? For example: He would be great at buying cheap then selling expensive, raking in tons of cash. He could splash it on the best armour and weapons which will cover his lack in strength. He could buy training, books to teach him. But why not also have the option to pay others to do the fight for him? He'd be able to convince them with his brilliant wordplay and get a reasonable price to pay for their services. Heck, why couldn't he target some of the main bad guy's henchman and 'talk them over' into rebelling against their master? That's what RPGs need, I think! Options for every type of character! You see, this is why I enjoy paper and pencil (PnP) RPGs more than CRPGs. In PnP RPGs the DM gets to ascribe whatever xp he/she feels appropriate to whatever solution the players come up with in an adventure. Well planned adventures can involve true role-playing with powerful nuanced ethical dilemmas, choices that matter and no save button to explore the consequences of each option. True, most RPGs favor combat, but then most people favor combat in a make-believe world. Its exciting and not something you get to do in the real world. But certain RP systems require less of it and favor ambiance and narrative. Of course it takes a fair amount of maturity to handle such games. I am currently teaching some boys (ages 8-11) how to play D&D and I can see how they have been totally corrupted by MMORPGs. They see their characters only in terms of levels and points, and see everything in terms of combat. One wants to play a dark elf "necro-knight" (I still have to figure out what that is), another a paladin, another a good elven "red dragon deciple". They of course have no notion that it might be difficult to imagine such characters adventuring together. I need to explain to them that PnP RPGs invovle a story that makes sense and that monsters don't just hang around in well-distributed bunches waiting to be slaughtered by anonymous cool-looking heroes. Characters don't just "hook-up" for some casual monster bashing. But at the same time I don't want to crush their dreams about their characters. These kids aren't exactly the coolest of the cool--more like young Napoleon Dynamites (sort of like me and my friends at that age). Anyway, I think that levelling appeals to our inner baboon. Its like a form of abstracted dominance hierarchy. Level 3 is more powerful than level 2. But throughout our society are analogues such as pay grades in jobs, grade levels in school, getting a diploma, BA, MA or PhD. There is certainly a "DING" experience associate with these (grad ceremonies). But just like in RPGs the requirements in life to "level" are pretty arbitrary but the benefits ascribed to each "level" such as increases in pay, or better job opportunities etc are very real. Of course a lot of people refer to all this as the "rat race", which we somehow managed to simplify in computer form for CRPGs for those who find the larger games of our society too stressful. So unless you want to be Thoreau you are stuck with a clunky system that favors min-maxing munchkins, twinkers, and DM girlfriends. Here's to building a better system! Anyone else remember Fallout 1? In that game you could talk to final boss out of conquering the world. Not that it was really practical to spend NO effort on combat skills, but for all the really important parts, persuasion was a valid alternative. The main problem I had with Morrowind's system was that I felt it turned into a major grind-fest. Advancing in the story didn't really give out rewards - a few pieces of equipment, but Morrowind's enchanting system was so broken that if (like me on my first attempt) you let your inner min/maxer loose, you'll end up invincible way too fast. That's why I argue for story-based advancement, a la Black Isle (Fallout 1&2, Planescape). Another system I've seen used is for the boss battles to give way more experience than standard battles, which solves the two main balance issues I see throughout CRPGs - the need to grind through monsters to get powerful enough to advance in the story, and the ability to grind so many monsters that the story loses any challenge. Because, at least for me, the story of a game is almost always more interesting than fighting random monsters. My favorite games are the ones where you more or less progress from puzzle to boss battle to city to puzzle without ever really noticing the random encounters (if any).